Welcome to the Raka Weekly Roundup, where we cover the week’s news and trends and tell you exactly what you need to know. This week, SparkToro helps us alleviate “fake followers” and Google makes your visual search experience more exciting. It’s safe to assume most people reading this post have heard of Moz. It was started by Rand Fishkin and Gillian Muessig in 2004 and has become a powerhouse of an online community of SEO experts and cutting-edge SEO tools. SparkToro built this tool after analyzing 35,000 fake Twitter accounts and determining the key identifiers that make them “fake.” The tool uses this information when analyzing your account and considers another Twitter account fake if it triggers 7-10 (or more) of the signals built into the tool. They go into the nitty-gritty of their research methodology in their blog post, but suffice it to say, their hard work is our gain. By performing a fake follower audit, we can find and flick those fake followers back to Fraudsville. (Try saying that three times fast). As a side note, SparkToro also announced this is probably the last free tool they’ll launch as they are working on something bigger—SparkToro Audience Intelligence. We’ll save the details on that until launch date, which is scheduled sometime in the first half of 2019. Stay tuned! Being able to search for images or videos isn’t anything new, but this week, Google announced the following features to make your visual search experience that much better. 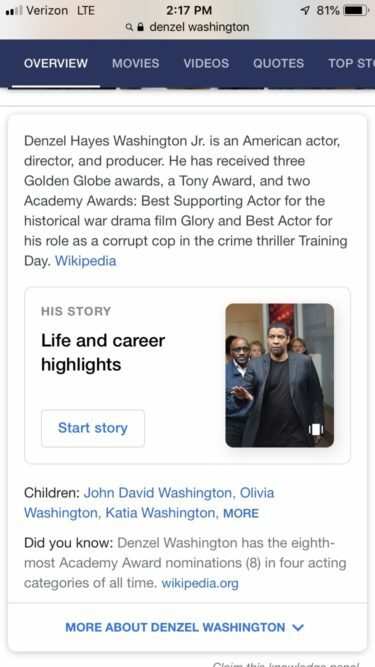 Earlier this year, Google worked with the Accelerated Mobile Pages (AMP) project, an open source library that makes it easy for anyone to create a story on the open web. So far, publishers, advertisers, and e-commerce companies are utilizing this functionality to tell visual stories about their products and services, and it’s gaining traction. Now, Google is jumping on the AMP bandwagon and using AI to construct their own AMP stories. For now, they’re focusing on famous people, like celebrities and athletes. 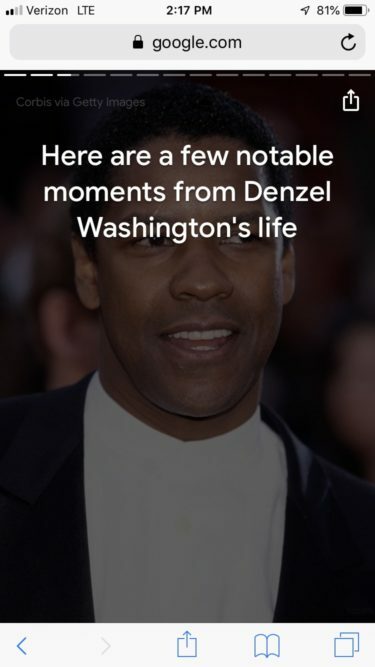 Curious about Denzel Washington? Enter his name in your browser, click on “Start Story” and learn a few notable moments about his life. Try it with your favorite celebrity, you might learn something new. Have you ever searched for a specific topic and found yourself falling down a rabbit hole of disappointment into the bowels of YouTube, ultimately wasting hours of your life? Well, this one’s for you. We know Google has a deep library of videos, but now they also have the context of each of these videos to help you find exactly what you’re looking for. They’re calling them “feature videos.” If you’re searching for fun things to do in Las Vegas, this new feature will give you a broader view of the topic. It may also take you on a featured video tour that will show you around the city before you even get there. We all know page ranking and authority are critical when Google crawls your site, so if someone is searching for a particular image, sites that rank higher will move to the top of the pack for that image search. Another determining factor is image positioning. If an image from your site comes up in the search results, then it better be front and center when the viewer clicks on it, otherwise your site will move down the Google food chain. Google introduced Google Lens last year to give us a closer look at the images we love and learn more about the objects in them. Out shopping and see an outfit you like? Google Lens can take a closer look at those swanky jeans you’re admiring and find them for you, as well as similar items, so you can buy them and be smilin’ and stylin’ in minutes. Soon Google will be introducing Google Lens to Google Images to help you explore, learn, find, and perhaps purchase just about anything that catches your eye (well, not anything). Everyone knows a picture is worth 1,000 words and Google gets it. They’re working to make your search experience more visually interesting, informative, and fun. Enjoy!